This is rather unfortunate because it makes code (and especially tables like the above picture) very hard to read. The Chrome browser clearly supports preformatted text, because it shows up correctly if I request the desktop site. (But then, it is more difficult to use the site). Chrome for Android has a sketchy history of bad support for monospace and font-family in general. I've substituted the old simple "monospace" we used with "Consolas,Menlo,Monaco,Lucida Console,Liberation Mono,DejaVu Sans Mono,Bitstream Vera Sans Mono,Courier New,monospace", which is what we use on the desktop site, which Chrome for Android seems to handle correctly. This will be out in the next builds (2253 on meta and 1611 on the network). Not the answer you're looking for? 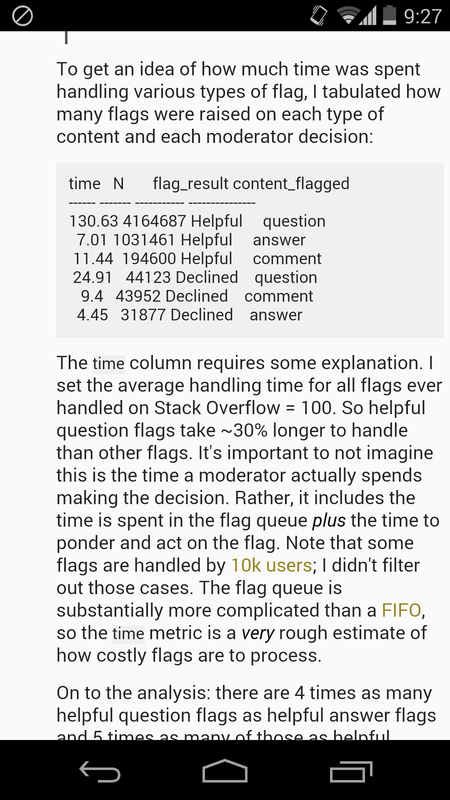 Browse other questions tagged bug status-completed code-formatting mobile-web .